Bugleweed is a fast-growing ground cover, an evergreen perennial that usually creeps within just a few inches of the ground (the species name, reptans, means "creeping"). It presents gardeners with a tough decision in plant selection. Although it has pretty flowers and is available in several different cultivars that work well in landscaping, it can also make quite a nuisance of itself through rampant spread. But there are a few situations in which its good qualities will be enough for some gardeners to grow it. Ajuga is excellent for filling in large, shady areas where lawns are difficult to grow, and it can work well on banks or slopes, or planted around trees and shrubs. It forms a dense mat that will choke out weeds, and it is known to be fairly resistant to deer. It is so tough that it can even grow under black walnut trees (Juglans nigra), which produces a chemical that discourages most plants. But avoid planting bugleweed near lawn areas, since it can quickly begin spreading into turf grass. Bugleweed is a dense, mat-forming ground cover with shiny, dark green leaves. Tiny, blue-violet flowers bloom in mid- to late-spring on spikes that can rise 8 to 10 inches. Several cultivars are available that offer different foliage colors and patterns. Plant bugleweed in well-draining, fertile soil in full sun to partial shade, in an area where air circulation is good. Space plants about 1 foot apart. Water whenever the top 1 to 2 inches of soil become dry—once established bugleweed usually does fine if it is watered only once every 2 to 3 weeks. Feeding is necessary only if the plant is growing in poor soil. Use a standard balanced granular fertilizer. Morning feeding is best, and make sure to rinse off any fertilizer granules from the leaves. Cut off the flower spikes in late summer after the flowers turn brown. A large planting area can be sheared with a lawnmower set to a high blade height. To keep the plant under control, rigorously prune down the stems of bugleweed twice a year. Make sure to cut off any runners escaping the desired planting area. If the planting area becomes crowded, thin it out in the fall, by digging up the entire clump and replanting half of the roots. Water thoroughly after replanting. Bugleweed does well in full sun to part shade locations. The plant prefers medium moisture, well-drained soils with a good amount of organic matter. Water weekly while plants are getting established, then once every 2 to 3 weeks. Bugleweed is fairly tolerant of dry shade locations. Bugleweed does well in a wide range of temperatures, but in very hot, humid areas, it requires good air circulation to prevent crown rot. Feeding is rarely necessary, but when it is necessary, apply an all-purpose granular fertilizer. Or, use a water-soluble fertilizer at a rate of 1 tablespoon per 1 gallon of water. Ajuga is one of the easiest plants there is to propagate. It spreads by underground runners, called stolons, that form clumps surrounding the parent plant. At the point where these clumps begin to get crowded, you can dig them up and transplant them wherever you want. It is best done in early spring or fall. Dig up the entire mother plant and surrounding clumps, then separate them by hand or with a knife. Discard brown or withered clumps, and plant the others in new locations. Ajuga can also be propagated by seed. Start them indoors pots filled with seed-starter mix. Cover the seeds with a thin layer of compost; they will sprout within a month. When the seedlings are viable, they can be potted up into larger containers. Once robust, the new plants can be transplanted into the garden. A. reptans 'Atropurpureum' has bronze-purple foliage. A. reptans 'Chocolate Chip' has darker leaves than the species plant, including a hint of chocolate brown. A. reptans 'Burgundy Glow' has variegated foliage that's tricolored (white, pink, and green). A. reptans 'Dixie Chip' is variegated in three colors (creamy-white, deep-rose, and green). A. reptans 'Black Scallop' has perhaps the darkest leaves of all of the cultivars. 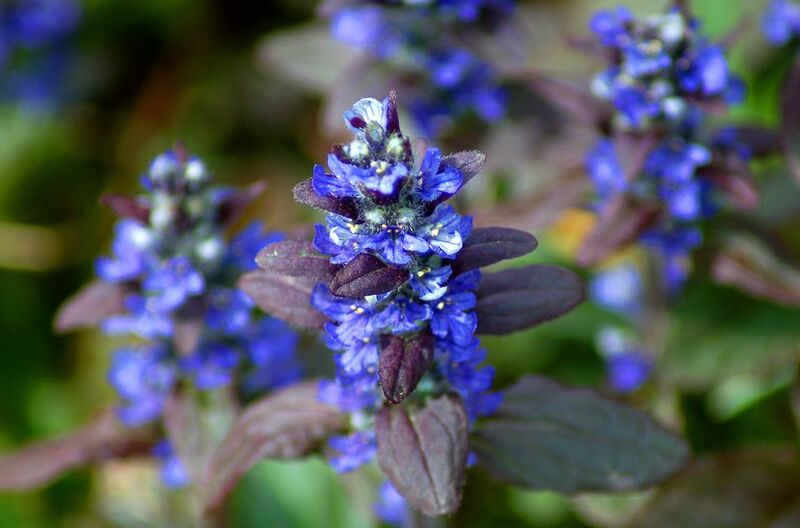 This is a very easy-to-grow plant, and that quality is actually ajuga's worst fault. Ajuga spreads aggressively via runners, a fact that should alert you to its potential to be invasive. To control it in your planting beds, you'll have to be faithful about pulling it out from where it doesn't belong. If you're not vigilant about controlling it, it will soon gain a toehold and become a pest. In the South, watch out for crown rot, also called "Southern blight," which is caused by a fungus (Sclerotium rolfsii). You can help prevent it by assuring that your soil drains well.